ON TUESDAY January 10th, the Common Council in my city of Kingston, NY met to vote on Mayor Steve Noble’s resolution to reaffirm “Kingston as a welcoming and inclusive city.” To me, it seemed a modest goal. A “sanctuary city” limits the role of local police in enforcing federal immigration law, exercising its right not to expend local resources to aid Federal Immigration and Customs Enforcement (ICE). 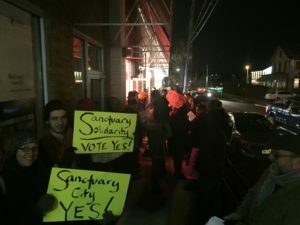 In a sanctuary or welcoming city, the municipality recognizes that all people deserve the same basic protections under the law, regardless of perceived immigration status. A welcoming city’s police department does not inquire about anyone’s immigration status as a matter of course. A January 1 poll on HudsonValleyOne.com (the news website of Ulster Publishing), showed that only 51% appeared to favor this humane and commonsense measure. The day before the vote, I called my Alderman, Reynolds Scott-Childress, to confirm that, as reported by local news outlets, he planned to vote for the resolution. He did. He also reminded me that before the vote, there would be an opportunity for public commentary and that speaking up could be helpful, as he believed some aldermen had not yet made up their minds. I vote in every election — city, state, and national — and I’ve made phone calls and knocked on doors to support candidates. Yet my previous encounters with local government had involved driver’s licenses, my marriage license, and reporting for jury duty. I’d never been in the council chambers before. 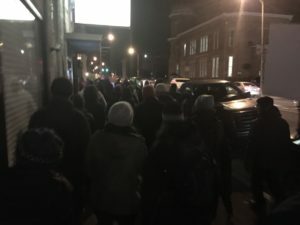 On that Tuesday night, as I drove to City Hall, I passed about 150 people (organized by Citizen Action) marching up Broadway on their way to the meeting, chanting “Love, not hate, makes America great.” I honked and waved in support. 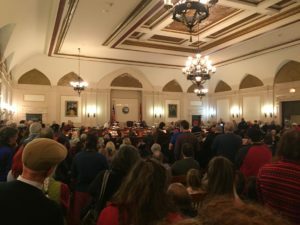 Inside, the council chambers were already full, every seat taken, so when the marchers arrived they had to crowd in. When the Fire Marshall expressed concern that exits were blocked, some of them went to stand behind our aldermen, in the grand space between their desks and the Alderman at Large’s. What brought me to this meeting was, in some respects, a series of random happenstances. My husband and I moved here from Brooklyn ten years ago, buying a house in uptown Kingston because it was less expensive than renting across the river, nearer my then-job at Bard. It also seemed to offer an easygoing sense of diversity. In Poughkeepsie, the Robert Moses highway cuts off an impoverished, majority-black neighborhood from essential services and more middle-class, majority-white neighborhoods. But in uptown Kingston, multi-unit dwellings stand alongside single-family homes. Wander around on a warm spring day and you’ll see racially diverse groups sitting out on porches, talking. Our eight year old now attends George Washington Elementary around the corner, where about a third of the students are white, a third black, and a third Latinx — from working, middle, and upper-middle class backgrounds, some US-born, others immigrants. In the summers, he attends camp at the Forsyth Nature Center, an oasis in a public park. The program’s director is Julie Noble, whom he idolizes — and her husband is now the mayor. So we know him, if slightly — he used to lead kayaking trips on the Hudson River — and perhaps that has made me more alert to issues here. Or perhaps, as so many people are discovering right now, I am more ready to act locally when national and global chaos loom. 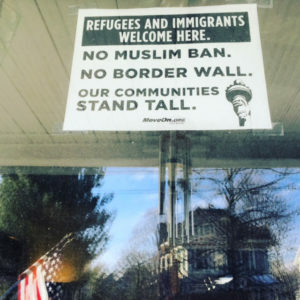 Mayor Noble’s “welcoming and inclusive city” measure seemed like such an easy, non-binding way to affirm that we welcome people here, regardless of their background or legal status; a simple way to stand our ground against kleptocracy and divisiveness. This is why I was shocked to see how many of my neighbors opposed the measure, in conversations on the street and on Facebook; and why, at the meeting that night, I was still surprised to see how vehement that opposition was. According to the Kingston Daily Freeman, thirty-seven people spoke up in public comments to support the measure and only seventeen to oppose. My experience was that those in opposition were angrier, and seemed to take up more space in the room as a consequence. A common thread in the opposition was a misinterpretation of how the term “sanctuary city” would change policing. Kingston City Police Chief Edigio Tinti is on record as saying that the resolution would not change his department’s practices. Though police forces all over the country have a long way to go in eradicating prejudice and avoiding profiling, I applaud his department for affirming their commitment to serve all Kingstonians. When people trust that their first responders will not inquire unnecessarily into immigration status, people of all statuses can freely seek help and report crimes. Imagine the situation of an undocumented person who is mugged or raped. In some cities, that person might hesitate to report the crime and get needed medical and legal help out of fear of deportation—and the perpetrator of the crime might remain at large to harm others. Sanctuary policies may actually enhance law enforcement’s ability to investigate crimes effectively. And because a welcoming city chooses not to use its local resources to enforce federal immigration law, that city saves money. Your federal tax dollars should go to fund federal issues. Your local tax money is having a hard enough time paying for road maintenance and the public schools. One argument I heard against the “welcoming and inclusive city” measure at the meeting came from a guy in a MAGA hat, who said he didn’t want Kingston to start attracting undocumented immigrants; he thought the measure would make the undocumented flock here. I’ve encountered this argument on Facebook too. People who continue to make it don’t seem to understand that “sanctuary” is not synonymous with “magnet” and doesn’t imply “free handouts.” Since the resolution isn’t an offer of legal status, a secure job, or higher wages, it seems unlikely to attract undocumented people. It does, however, reaffirm our commitment to the safety of all of our residents. It also confers another important advantage: access to due process of law. Although the Constitution guarantees that if a person is arrested, her case will be handled according to due process, immigrants are one of the groups whose cases are most likely to be mishandled, whether because of a language barrier or because of bias within the legal system. Extending this fundamental human right to all Kingston’s people helps ensure everyone’s right to fair treatment in a court of law. Although there will always be some who imagine that they get to decide when to shut America’s doors, that’s not the welcoming spirit of the country I believe in. It certainly isn’t why the lines “Give me your tired, your poor, / Your huddled masses yearning to breathe free” from Emma Lazarus’s “New Colossus” appear on the Statue of Liberty’s base. If you, like me, are a US-born citizen, there’s a fair chance you descend from immigrants who came to this country to escape persecution and/or make a better life (and likely faced some form of discrimination). Your ancestors may also have been brought here against their will as chattel, and survived to build a better life for you despite ongoing discrimination, personal and legal. The notion that earlier generations did it the “right way” while new immigrants are “lawbreakers” by the mere fact of their entry into the United States is misinformed and misleading. Our current immigration system simply does not afford the same opportunities for “legal” migration as in the past. The wealthy and those with sought-after skills have an easier time applying for permanent resident status or citizenship than do ordinary working people. The night of the Common Council vote, Kingston heard testimony from Leonides Santos, a local restaurant owner who has sought to become legal since entering the United States in 1994. He has attended every immigration meeting, paid every fee; and was just informed the day of the meeting that he has thirty days to leave. Unless the collective outrage of this community can change an immigration judge’s mind, Leo will have to leave his thriving business and his thirteen-year-old American-born son behind. Like so many undocumented people, Leo is bound into a community, and his absence will leave a gaping hole if he gets deported. Leo is a kind neighbor and a responsible business owner; the mother of his son is an American citizen. Keeping families like his together is of paramount importance. Immigrants, documented or otherwise, can live precarious lives. Business success stories such as Leo’s are not the only possible plot line. Migrants are disproportionately likely to live below the poverty line, suffer from food and housing insecurity, and have their labor exploited. The undocumented also pay taxes — income, sales, and property — without qualifying for any federal assistance programs. It’s our moral obligation to protect the most vulnerable of our neighbors. This ensures a peaceful, welcoming community for people of all socioeconomic statuses, orientations, races, and religions. In this way, rights and civil liberties function more like love than like game consoles. They are not limited in amount or number, but grow stronger the more we experience and share them. I think about Deuteronomy 10:19 every year at Passover. The Haggadah reminds us not that our ancestors were slaves in Egypt, but that we were: that their suffering is ours; that suffering of the same kind still goes on all over the world today. We pause each year to give thanks for our freedom, but after the festival we need to get back to work until everyone is free. Though this Common Council meeting took place only a few weeks ago, it also took place in another era: the Obama presidency. On January 10th, many of us still hoped that someone (the Supreme Court? President Obama, finally showing off his superpowers or at least giving Trump the marshmallow test, as Paul Noth’s New Yorker cartoon suggested?) would save us from the moral and political nightmare we are now living. In the first weeks of the new presidency, Trump has already signed an executive order that flagrantly violates the First Amendment in blocking entry to the United States by people — including legal US residents — from seven majority-Muslim countries. He has not only appointed ex-Breitbart white supremacist/neo-Nazi Steve Bannon White House Chief Strategist, but has restructured the National Security Council to make a place for him there. These are perilous times for immigrants and refugees, even though, as I write this, a Federal Judge in Washington state has for all practical purposes overridden parts of the ban, and the White House’s first appeal was summarily rejected. Still, the country’s immigration policy is very much in play, and all of these lives hang in the balance. Many — and unfortunately, this is an ever-broadening category — are in danger: those seeking residence and asylum right now, those here who haven’t yet attained legal status, those here with legal status, and perhaps even those whose families have been here for generations but who belong to minority groups against whom the President (or Bannon) discriminates. A small, vocal minority in this country espouses the President’s xenophobic beliefs. The same is true here in Kingston. In the United States and in this city, people from widely diverse backgrounds generally treat one another with respect, just as I saw in passing the first time I drove through town. At George Washington Elementary, my son’s class is not only race and class diverse, but diverse across the axes of religion, family structure, and parental gender orientation too. I believe that spending his days with kids from diverse backgrounds, many different from his own, will help him to grow up to be the kind of person who understands that human rights are all humans’ rights—and that he has a duty to defend them. Another way to say this is that it will make him an American. Our municipal laws remain unchanged at this time. But the yes vote on the resolution may influence them going forward. We are one city among thousands, and one of many to have passed resolutions to become welcoming and inclusive. We—We the People—need more. If every municipality signs such a resolution, the United States can remain safe for immigrants, refugees, and perhaps even the rest of us, no matter the federal government’s policies. If you, like me, feel more engaged politically than you ever have been before, then this is a straightforward task for your to-do list. If your city doesn’t have sanctuary or welcoming city policies on the books, call your mayor, call your city councilor. In my city of 25,000, only seventeen stood up at City Hall to speak against the resolution. I’d call that pretty good odds in favor of righteousness, civic order, and truth. I remain hopeful that you’ll find the same is true where you live, even as the national administration skews toward cynicism, plutocratic nihilism, and lies. Emily Barton is the author, most recently, of the novel The Book of Esther, a regular contributor to The New York Times Book Review, among other publications, and a recipient of fellowship from the Guggenheim Foundation and the National Endowment for the Arts. Follow her on Twitter @embleybarton and Facebook . If you’d like to write a letter to support Leo’s case to remain in the United States, visit the Facebook page of his restaurant, Just For You, for information about how to do so. 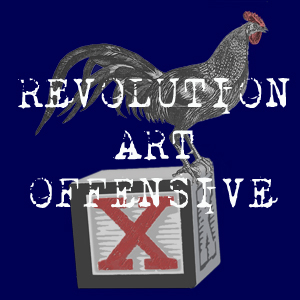 This entry was posted in Uncategorized and tagged Citizen Action, Constitution, Emily Barton, immigration, Kingston, president trump, sanctuary city. Bookmark the permalink.